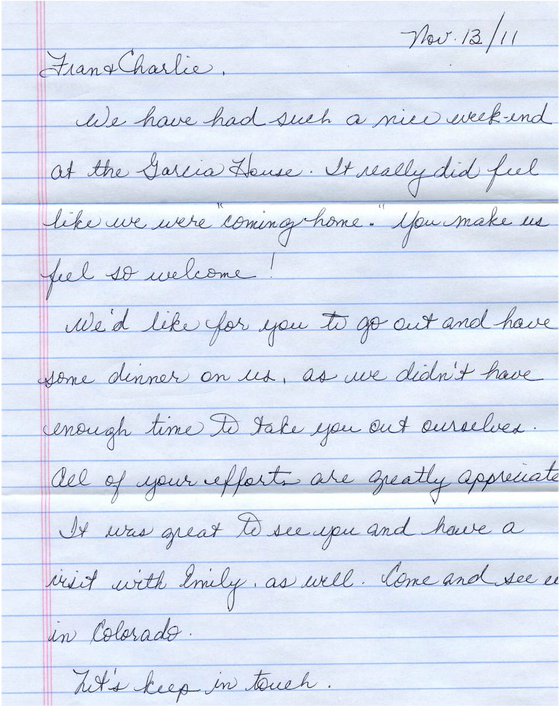 Our comments include those left with us and those left on our VRBO listing. We've now got two pages going! WOW! as a fellow VRBO owner we have stayed in several VRBO homes, all great experiences, but this by far was above and beyond. The detail and extra special personal touches were perfect. We have many friends that live in Tucson and love to go down and visit, but hate imposing or working around other peoples schedule, this is the perfect place. affordable and cozy, Parking and patio were great also. Thank You so much Fran! 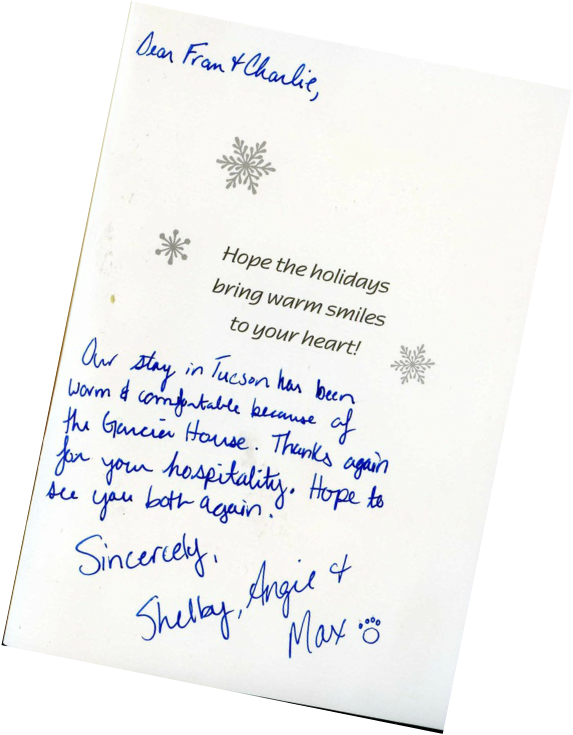 Garcia House was our first experience with VRBO, and it was a winner. It is located in a peaceful residential neighborhood, 5 miles from downtown Tucson. It is ideal for a couple like us whose focus is in-town events, allowing for daylong side trips when there’s time. The small apartment, attached to the main residence, is completely private and quiet. It is decorated with Southwestern prints and custom tiling in the kitchen and bathroom. There is a welcoming patio with a grill that encourages outdoor living. The Murphy bed is quite comfortable, an asset allowing for much more living space during the day when it is folded up. The high speed WiFi connection worked seamlessly. Fran’s artistic flair and close attention to renters’ needs and comfort is evident everywhere; her provisions could not have been more thoughtful. The photographs are accurate and representative. If you are looking for a high-priced, luxury condo at Pebble Beach this is not for you. If you want a comfortable, convenient, reasonably priced pied a terre, close to downtown Tucson this is a winner! Garcia House is in a great central location and is close to everything from Sabno Canyon to the downtown and historic areas. 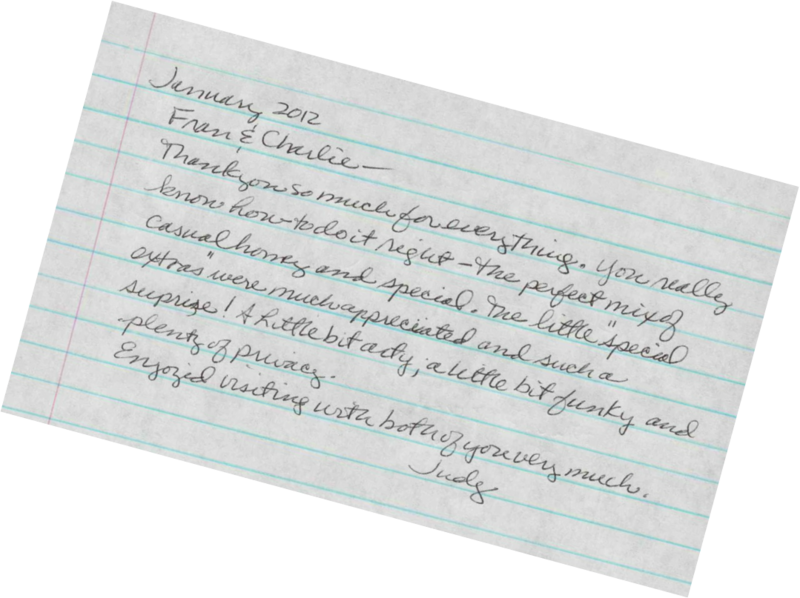 Fran and Charlie provide everything that you could possibly want or need in a vacation rental plus many extras. The bed and furniture are very comfortable and the decorating is beautiful. We also enjoyed the barbecue grill and the outdoor area. 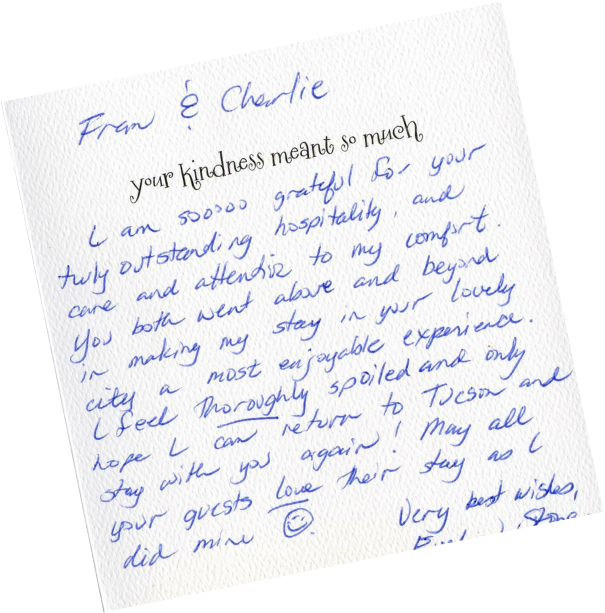 Thanks to Fran and Charlie for making our week in Tucson great! Our stay at the Garcia House was perfect! The home owners were VERY helpful with little extras during our stay. I would recommend this little apartment to anyone looking to stay in mid-town Tucson. See you next year!! It was wonderful to have R&P from Ft. Collins pay us a return visit! 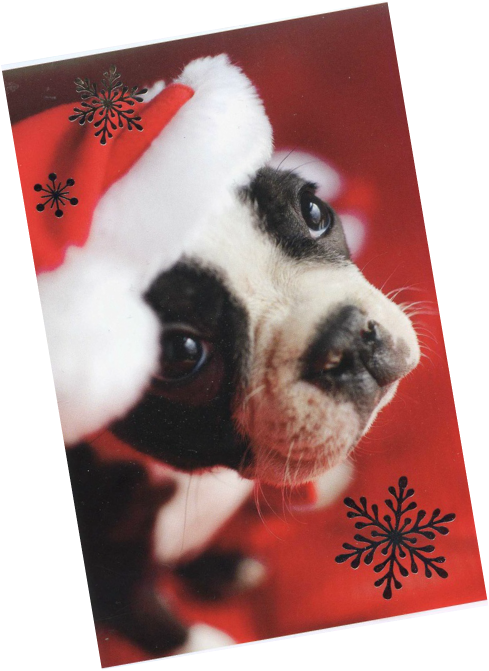 Thank you so much Judy of Judy and Ed from Colorado! 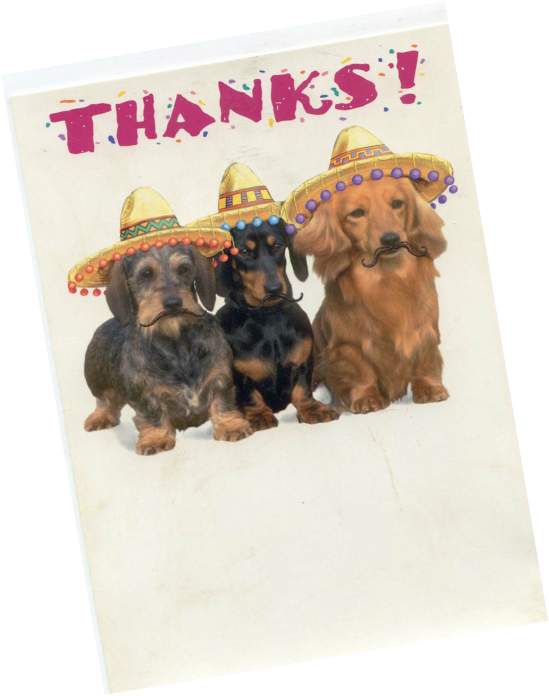 I recently rented the Casita (mini-hacienda) and found it very, very nice with everything well appointed, including some special sweets that were left for us and the dog! Yes, I had a small dog and it worked out very well, with a large fenced area in the back of the property for her to get some exercise in the morning while I had coffee and read the paper in the garden area! The hosts, Fran and Charlie, were extremely helpful and nice and very close were lots of excellent restaurants on Campbell Street. I had an excellent stay and I would certainly stay here again! My wife booked this place for my parents and it surpassed both our expectations and those of my parents. 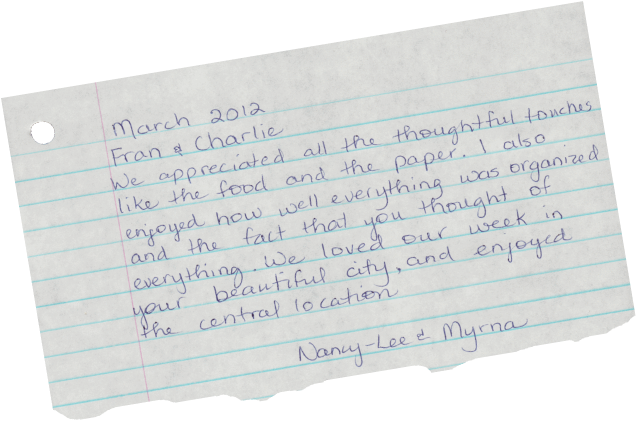 Fran and Charlie are amazing hosts who are rooted in their community and dedicated to making guests feel welcome. Fran offered to supply coffee, cream, and fruit for their arrival, in addition to the already well stocked pantry, and linens. Every need was thought of and supplied for, and my parents were raving about the hosts every day of their stay. Fran and Charlie took time to visit with them, introduce them to the area, and give them personal insights of what to do and see. Also, the guest house is very warm, great colors and vacation like feel. My parents have already told me they really want to stay here again when they return next year. Recommended for:Romantic getaway, age 55+. We initiatally located Garcia House on Google Maps in the area we wanted to stay for a couple days while visiting relatives. The description and pictures on VRBO enticed us to select this particular apartment. All our communications via VRBO and with the owners was timely and flawless. 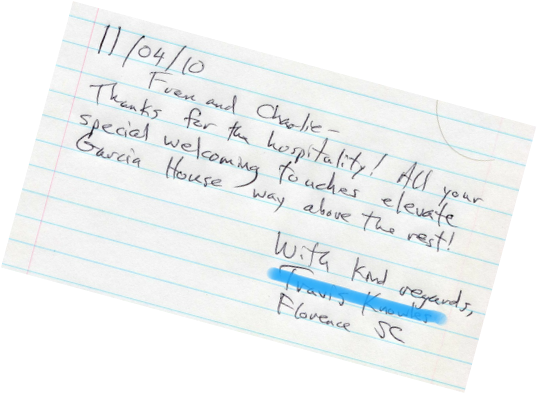 Upon arrival, the owner was a gracious hospitable hostess who personally greeted us at the entrance providing a genuinely sincere welcome then showing the property and amenities. Attention to detail was incorporated in every aspect from the decor to area attractions, including coupons for local eateries; reading material including daily newspaper; any toiletry you might need, more than you would find in a 5 star resort; fresh fruit in the kitchenette plus fresh chips and salsa; and for a personal touch, there was a personalized colorful greeting card welcoming us to the apartment! We had not slept on a murphy bed and were pleasantly surprised it had a very comfortable full size mattress, we slept well. The TV has extensive channel selection plus they provided a couple dozen DVD's to choose from. We were so pleased, we brought two car loads of relatives over to show off this lovely find. It is obvious the owners have put a lot of thought into the set up and ongoing care and maintenance of the property. We highly recommend this property to any single person or couple wanting to stay in a residential area of mid-town Tucson. This was our first time to try VRBO and thanks to Fran and Charlie we will definitely use it again. They were great and thought of everything to make the home functional and comfortable. A bonus was that we enjoyed them and spent time visiting with them when we weren't out and about. Fran even learned that it was our wedding anniversary and brought us a special cake and a lovely card. Very thoughtful! For us it was a very central location for visiting all of my relatives. And there was a lot of information in the home telling us of local places to eat, shop and sightsee. I would recommend this place to anyone that I know. 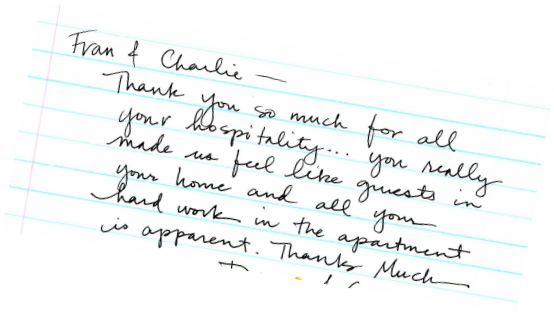 We so sincerely thank all of our wonderful Guests and their comments! This page is getting a little too long so we've now got a second page for comments.